Agromin is excited to be part of the Ninth Annual Wings, Wheels & Rotors Exposition, Sunday, October 24 at the Los Alamitos Army Airfield. The expo will have a huge display of military and emergency aircraft and military equipment. A car show will feature custom cars, new autos, motorcycles, roadsters, antique vehicles and hot rods. They'll be plenty of food and live entertainment. Kids will get a chance to paint pumpkins at our booth with the help of high schoolers involved in the Buena Park High School chapter of the Future Farmers of America. They can also pick up free green recycling activity booklets and get their face painted. The pumpkins come from a one-acre pumpkin patch on the base. Agromin used compost made from organic material collected from surrounding communities, to supply the nutrients to bring the otherwise fallow ground to a healthy status. Seventy pumpkin plants were planted and now the pumpkins are ready just in time for Halloween. Admission to the Expo is free. 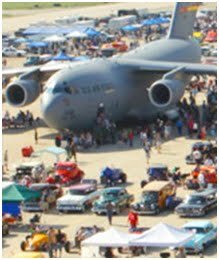 The Wings, Wheels & Rotors Expo, presented by the Los Alamitos Area Chamber of Commerce and the California National Guards Joint Forces Training Base, runs from 9 a.m. to 4 p.m. For more information, go to . Hope to see you there! See you at the Wings, Wheels & Rotors Expo!